HOFFMAN ESTATES, Ill. – AUGUST 31, 2017 – On Thursday, June 8, the Greater Philadelphia-area I-CAR committee held its second annual fundraiser at the Scotland Run Golf Club, in Williamstown, N.J. to benefit the Collision Repair Education Foundation and local collision repair school programs. Over 160 people participated in the golf tournament, evening banquet and silent auction. Over $46,000 was raised to support the Foundation and local education initiatives to improve the availability of trained, entry-level technicians in the market. Sponsors of the event included: PPG, Platinum Sponsor of the Event; 3D Bodyworks; ABRA Auto Body & Glass; Airright Technologies; Bergey’s Wholesale; Bill Flannery Automotive; Brandywine Coach Works; Caliber Collision; Conicelli Dealerships; Elite Electronics; Enterprise Rent-a-Car; Euromotorcars of Devon; Fred Beans Auto Group; Gerber Collision & Glass; Innovative Solutions & Technology; K & S Towing; LKQ Corporation; Matrix Electronics; Mercedes Benz of AC, FW & WCMike & Allison LeVasseur; Norton; Paul’s Towing; Service King Collision Repair Centers; Sherwin-Williams. According to Ferguson, the bulk of this year’s funds will go to support the Hodgson Vo-Tech Auto Body program with smaller amounts going to other schools in Southeastern Pennsylvania. In addition to equipment and curriculum support, the committee is starting a new initiative to pay for 10 students to graduate with their I-CAR points and be more attractive to prospective employees. Last September, the Committee raised over $30,000 at its inaugural event, bring the total raised from the two events to over $76,000. Clark Plucinski, executive director of the Collision Repair Education Foundation, thanked the committee for its continued support of the local schools and challenged other local groups to work with schools in their market to help improve the prospects for young people training for a career in the collision industry. 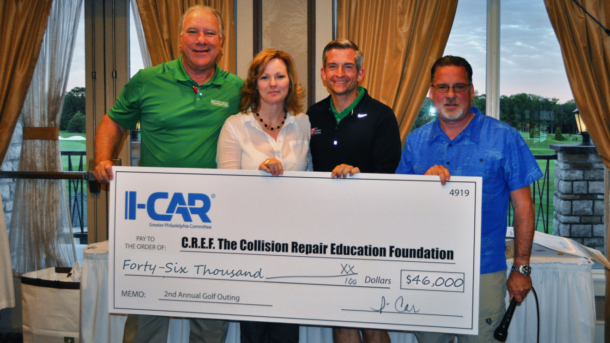 CAPTION: The Philadelphia-area I-CAR committee raised over $46,000 at its second annual golf outing in June to support collision repair school programs in its market through the Collision Repair Education Foundation. (L-R) Clark Plucinski, executive director of the Collision Repair Education Foundation, receives the big check from Lisa Ferguson, ABRA Auto Body & Glass; Joe James, Bill Flannery Automotive and Pennsylvania Chair for I-CAR; and Mike LeVasseur, ABRA Auto Body & Glass. HOFFMAN ESTATES, IL – August 31, 2017 – The Collision Repair Education Foundation is currently accepting nominations for its “Collision Student of the Year” award. The deadline for nominations is September 22, 2017. Launched last year, the Collision Student of the Year award, seeks to recognize truly outstanding students training for a career in the collision industry. Nominated students must currently be studying collision repair/refinishing at a school that has completed the Foundation’s 2017-2018 Collision Repair School Solutions Survey. Winners of the Collision Student of the Year award and their instructors must be able to attend the Foundation’s reception on October 31st at the SEMA Show in Las Vegas, Nev. The award will cover two nights of hotel each for the instructor and for the student, airfare (or mileage if driving), and meals. HOFFMAN ESTATES, IL – AUGUST 31, 2017 – The Collision Repair Education Foundation and ASE will hold its third annual Cars, Careers, & Celebrities Expo event on Friday, September 15th at the Chicagoland Speedway in Joliet, Ill. in conjunction with the NASCAR Cup race taking place that weekend. The event will bring together hundreds of high school and college collision and auto service students, industry members, and sponsors. Over 30 companies are signed up to participate with the event and meet the attending students that will be traveling from the greater Midwest and beyond. Hundreds of students are anticipated to attend and they will have the opportunity to meet industry employers, view demonstrations, hold initial/mock interviews, meet race car drivers, and more in the Chicagoland Speedway’s hospitality village area. There is no charge for high school and college collision students, instructors, and administrators to attend. Companies currently participating include: Gerber Collision & Glass, ABRA Auto Body & Glass, Service King Collision Repair Centers, 3M Automotive, PPG Automotive Refinish, Caliber Collision, Allstate Insurance, Nationwide Insurance, State Farm Insurance, GEICO, Snap-on, Copart USA, CCC Information Services, Mirka Abrasives, AutoZone/ ALLDATA, Garmat USA, Cintas, WyoTech, Ranken Technical College, ADESA, Sears Auto, Ryder Inc., Collision Equipment Experts, Cox Automotive, Celette Inc., Auto Care Association, SimSpray Aidex, SkillsUSA, SEMA, and Women’s Industry Network (WIN). Companies still have an opportunity to participate at this event and are encouraged to contact Director of Development Brandon Eckenrode at Brandon.Eckenrode@ed-foundation.org/ 847-463-5244 for more information. Hoffman Estates, Ill. (July 17, 2017) – All of the student medalists in the collision repair technology and automotive refinishing technology competitions at the annual SkillsUSA Championships last month studied at schools that received grants from the Collision Repair Education Foundation (CREF). The 11 schools represented by the 12 high school and college SkillsUSA medal winners collectively received $916,000 in school improvement grants from the collision industry through Collision Repair Education Foundation administered grant programs since 2014. Among the winners was David Fors, a student at Montachusett Regional Vocational Technical High School, in Fitchburg, Mass., who won a silver medal in the high school collision technology competition. “Having a student win a silver medal at the SkillsUSA national competition was rewarding to the staff here at Monty Tech and the student gained experiences and life skills that will last a lifetime. The donations provided by the CREF really helps us prepare students to enter the workforce and prepare them for competitions, such as the SkillsUSA Championships,” said David Lelievre, collision repair instructor at Montachusett Regional Vocational Technical High School, in Fitchburg, Mass. Joel Hartstack, from Southwestern Community College, in Creston, IA; won a gold medal in the college collision repair technology competition. The Collision Repair Education Foundation aims to support collision repair educational programs, schools, and students to create qualified entry-level employees and connect them with an array of career opportunities. School grant programs are an important part of this effort, making sure students learn with the latest tools and technology necessary to repair today’s vehicles. For more information on how you can support the Collision Repair Education Foundation’s grant program, contact Christen Battaglia, at Christen.Battaglia@ed-foundation.org or 302-377-5202. For information on how to apply for school grants, visit the Foundation website (https://www.collisioneducationfoundation.org/school-grant-opportunities/), or contact Melissa Marscin at Melissa.Marscin@ed-foundation.org or 888.722.3787, Ext. 282.